Everyone's favorite puffball must once again save the day in Kirby's Dream Land 3 when the mischievous King Dedede starts causing trouble. 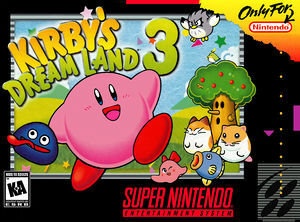 Kirby must travel through an assortment of levels, battling an exotic array of enemies (both new and familiar) determined to stop him from completing his mission. Always armed with his trusty ability to swallow enemies and gain special attacks, Kirby can also unite with some of his animal friends and make use of their particular talents. Featuring detailed graphics, challenging boss battles and the distinct charm of a Kirby game, it's no wonder this title is considered a classic. The graph below charts the compatibility with Kirby's Dream Land 3 since Dolphin's 2.0 release, listing revisions only where a compatibility change occurred. This page was last edited on 10 December 2017, at 22:12.